Eliminating environmental tobacco use exposure. Promoting quitting among adults and youth. Identifying and eliminating disparities among populations. This is no safe level of exposure to secondhand smoke. Secondhand smoke kills over 750 nonsmoking Alabamians each year. Children exposed to secondhand smoke are at an increased rish for Sudden Infant Death Syndrome, acute respiratory infections, ear problems, severe asthma, and reduced lung function. Learn what you can do to help. Studies show about 70 percent of all smokers want to quit. 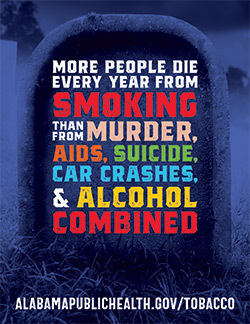 In Alabama, tobacco users can get free help by calling 1-800-QUIT-NOW (1-800-784-8669) or visiting quitnowalabama.com. Key findings of The Burden of Tobacco in Alabama are noted below. 8,685 deaths in Alabama were attributable to smoking-related diseases. 15.3 average of years lost among adults who died as a result of a smoking attributable illness. 157,920 Alabama residents are living with a smoking-attributable illness. $1.88 billion in excess personal medical care expenditures were attributable to smoking. $2.84 billion in productivity losses were attributable to smoking-related premature death. $941 million in productivity losses were attributable to smoking-related illnesses. $166 million in personal medical costs and productivity losses were attributable to exposure to SHS. Fifty years after Alabama native Luther Terry issued the landmark Surgeon General's Report on smoking and its health consequences, smoking is still the number one cause of preventable death and disease in the nation.